What Future For A Broken Society? Bosnia-Hercegovina and its capital, Sarajevo, once represented admirable examples of multiethnic and multifaith cooperation. But that paradigm of peaceful, mutual respect among religious believers – and, in the aftermath of Tito's Yugoslav Communism, non-believers – is broken, and there is little hope that it may be repaired; now, or ever. The independent Bosnia-Hercegovina that could have been – a post-Communist, European meeting place for all religions and interests, intellectual and commercial – vanished before it could be realized. If, somehow, it is rebuilt, it will be miraculously, in answer to the prayers of its innocent people. Sarajevo and Bosnia-Hercegovina, in pre-war times, provided an alternative place for cultural development, between powerful communal rivals on either side of them. There one could escape the intense, but officially-repressed nationalism of Croats to the West, with their own Yugoslav "republic," and the ascendancy of Serbs East-ward. Serbia had dominated Yugoslavia between the first and second world wars and after the establishment of Communism under Marshal Josip Broz Tito in 1945. The half million inhabitants of Sarajevo, according to the last Yugoslav census, taken during the collapse that former country in 1991, included a self-identified Muslim plurality of 49 percent. Orthodox Christian Serbs accounted for 30 percent, and Catholic Croats 6.6 percent. The remainder fell into the categories of "Yugoslav," without specifying an ethnic choice, and "Others." But Sarajevans intermarried, celebrated each other's traditional festivals, ate the local food, and read the literature and listened to the music of all their neighbors. Neighborhoods were mixed. In the Bosnian capital, other towns, and in numerous villages, mosques, Catholic and Orthodox churches, and Jewish synagogues (the latter mostly unused since the destruction of Bosnian Jewry in the Holocaust), stood close to one another. Many residents of the former Yugoslavia and outsiders were stunned that, in 1992, the interreligious goodwill for which Bosnia-Hercegovina and Sarajevo were known was subverted so quickly and disastrously. But religion per se had nothing to do with the Bosnian war. As in other such conflicts, faith was a pretext as a marker of competing ethnic and political interests. Most nationalist traditions and rhetoric had been submerged or suppressed under Tito, in the name of "socialist brotherhood and unity." When this model was undone, fighting was impelled by control of territory, rather than propagandistic excuses based on differences in religious observance or grievances in past wars and conquests. To emphasize, the Bosnian war was no more about religion than the Holocaust was about theological differences between Christians and Jews. In both instances, differing religious identities were means by which voracious and vicious demagogues, to consolidate their own power, identified "enemies" for murder by their armed followers. Thus the highly-assimilated German Jews were identified as part of an allegedly-malign "international Jewry," and thus the Bosnian Muslims, who were Bosnians first and whose expressions of Islam were and are theirs and only theirs, were labeled "Turks" and "Islamic fundamentalists" acting to "re-Islamize" the country. Both claims were lies. European Jewish life, however, although devastated, was reborn. Muslim Bosnia, saved by the Western powers, remains impoverished and demoralized, with its Islamic believers now objects of questionable interest not only by Serbs and Croats, but by Arab-financed fundamentalists, and, more recently, Turkish Islamists. 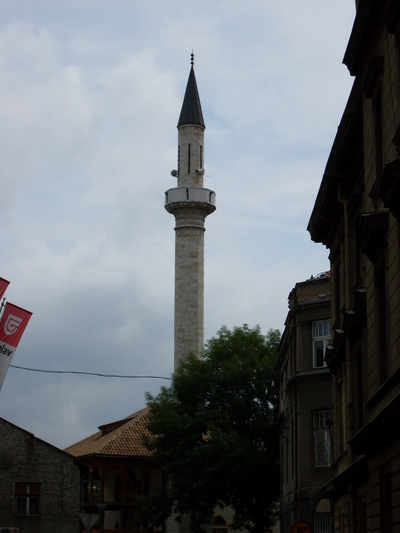 The Maghribija Mosque, 16th c. CE, Sarajevo – Photograph 2009 Via Wikimedia Commons. In reality, Bosnian Islam is not Turkish, and has always been culturally distinctive within the Islamic global community, or ummah. Few Turks, aside from governors and landowners, colonized Bosnia. Today, Bosnia has no Turkish-speaking remnant in its population. But it shelters a small Sephardic Jewish community whose ancestors arrived in the country after they were expelled from Christian Spain and rescued by the Ottomans, who settled the Sephardim in the urban centers of their empire. The Bosnian war ended in 1995 when U.S. president Bill Clinton intervened to impose the Dayton Accords. Bosnia-Hercegovina was left in stasis, with fundamental aspects of its wartime situation in 1992 enduring. In May 20 years ago, the Yugoslav army general Ratko Mladić, a Serbian ultranationalist, was transferred to Sarajevo, the Bosnian capital. He previously commanded the Knin Corps, operating within Serbian-occupied enclaves established inside Croatia, in defiance of the latter country's declaration of independence in 1991. Bombardment and sniping at the civilian population of Sarajevo, by Serb-led forces emplaced in the mountains surrounding the city, began soon after the Bosnian declaration of independence from Yugoslavia, supported by Bosnian Muslims and Bosnian Croats, totalling about 65 percent of the population, in March 1992. Found in Serbia and arrested a year ago this month, Mladić today is on trial at the United Nations International Criminal Tribunal for Former Yugoslavia (ICTY), in The Hague for genocide and other crimes against humanity. The proceedings, beginning May 16, were suspended on May 21 because the prosecution had failed to deliver the entire, enormous corpus of documentary evidence to the defense. Mladić will probably be found guilty and receive a lengthy prison sentence (the ICTY does not impose capital punishment). The prosecution will call 150 living witnesses and present written statements by about 250 more. The testimony will include the action for which Mladić is most notorious: the massacre of some 8,000 Bosnian Muslim men and boys at the United Nations-administered "safe area" around the eastern Bosnian town of Srebrenica in 1995. Meanwhile, in Serbia, Tomislav Nikolić was elected president on May 20. Nikolić is a former supporter of the Serbian Radical Party, led by Vojislav Šešelj. 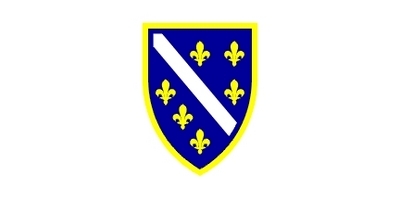 At The Hague, Šešelj is a defendant along with Mladić; Šešelj led the most extreme political faction backing the late Serbian dictator Slobodan Milošević in the series of assaults on Croatia, Bosnia-Hercegovina, and, in 1998-99, Kosova. 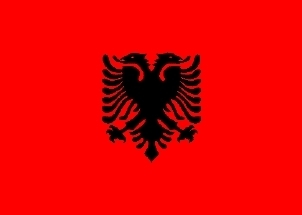 In 2008, Kosova declared its full independence from Serbia after nine years as a territory administered by the United Nations. Before his candidacy for Serbia's presidency, Nikolić redefined himself as a "progressive" eager for Serbian integration into the European Community. But on Kosova, Nikolić has shown no sign of change; he and the Serbian government insist that Kosova remains a Serbian possession. The partition of Bosnia-Hercegovina between a "Serb Republic" and a "Bošnjak [Muslim]-Croat Federation" was affirmed at Dayton. "Justice delayed is justice denied" even with Mladić and his atrocious colleagues in The Hague. A hard-liner on Kosova holds power in Serbia. A society that once stood for peace and mutual respect is, for now, free of ongoing collective violence, but has also been shorn of its legacy of intercommunal cooperation. What progress, then, has been made for the ordinary people of Bosnia-Hercegovina during the 17 years since Dayton?